On the eve of the World Health Organisation declaring Sierra Leone Ebola free, the minister of finance – Marah presented his 2016 Budget to the houses of parliament. According to the minister, the government will need hundreds of millions of dollars in grants and borrowing in order to balance the books next year. By the end of this financial year, the government would have spent over Three Trillion Leones, running a huge deficit and increased borrowing. For next year – 2016, the government has set its spending at almost Four Trillion Leones – a whopping Three Trillion Nine Hundred and Thirty-Eight Billion, Four Hundred and Sixty-One Million, Eight Hundred and Twenty-Thousand Leones (Le3,938,461,820,000). But so far this year, the National Revenue Authority (NRA) has only managed to raise less than Two Trillion Leones (Le1.7 Trillion), leaving a shortfall in revenue of almost Two Trillion Leones, which must come from somewhere, if the government is to meet its budget spending promises. The government may need to cut back on public services, reduce public sector wages, increase the rates of taxes, and or widen the country’s tax base. But one thing it cannot keep on doing year on year is, piling up the public sector borrrowing. Is Sierra Leone facing a financial meltdown? The massive decline in export revenue, caused in part by the Ebola crisis and China’s economic downturn, has impacted on the government’s finances. But the financial demise of large mining companies such African Minerals Ltd., had more to do with greed and corruption than the impact of Ebola. 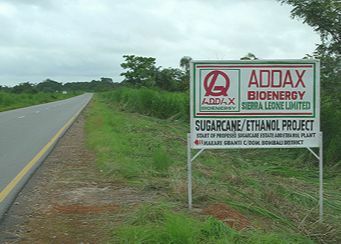 So too has the red flag been raised over the mismanagement of the Bio-Energy production company – Addax, which it is understood is now looking for a new owner, in the face of serious financial difficulties. Domestic tax receipts for the government have also declined sharply, as local industries and businesses suffer the effects of the Ebola crisis, following the imposition last year 2014 by government of measures aimed at restricting the movements of people across the country. It is estimated that Sierra Leone lost over $200 million in revenue due to the Ebola crisis, and economic growth will be much slower next year, especially if the slowdown in China’s industrial production continues. The country’s Gross Domestic Product (GDP) is forecast to grow by 0.1% next year, compared to the massive 25% decline suffered this year – 2015. But despite the huge impact that the Ebola crisis has had on the economy and government’s revenue, it was perplexing to see that the government went ahead with its 15% increase in public sector workers’ salary this year, which came into force in July. Yesterday, the Executive Board of the International Monetary Fund (IMF) completed the third and fourth reviews of Sierra Leone’s performance under a three-year arrangement under the Extended Credit Facility (ECF), and approved an augmentation of access of 45 percent of quota of about US$64.59 million, to be distributed in three tranches. According to the IMF, the completion of these reviews enables the immediate disbursement of about US$46.14 million. This amount includes the first tranche of about US$21.53 million. In completing the review, the IMF Board additionally approved the authorities’ request for waivers of non-observance of the end-December 2014 performance criteria on the ceiling on Net Domestic Bank Credit to Government Ceiling, the ceiling on Net Domestic Assets of the Central Bank Ceiling, and the floor on Gross Foreign Exchange Reserves of the Central Bank on the basis of corrective action taken. “With the World Health Organization declaring Sierra Leone Ebola free on November 7, the country now faces the difficult challenge of economic recovery. Complicating that task, the decline in iron ore prices has led to the shutdown of the main iron ore mines, with consequent sharp declines in GDP and exports, and reduced fiscal revenues. “As a result, the fiscal challenges in 2016 will be substantial. It will be critical for the authorities to ensure sufficient revenues and financing to cover priority spending, especially for the post-Ebola Economic Recovery Strategy (ERS). “This will require strong moves on tax policies and continued efforts on tax administration. Containing the wage bill will also be critical to increase the resources available for the ERS, which will be strengthened by enhancing the transparency and efficiency of expenditures. “The Bank of Sierra Leone (BSL) should continue targeting price stability in support of economic recovery. With depreciation pressures stemming from the lost iron ore exports, the BSL should enhance monetary policy instruments and liquidity forecasting to increase its ability to respond to any second round inflationary pressures. BSL should also enhance supervision of the financial sector, and seek to understand and resolve any underlying stress through a timely diagnostic of key troubled banks. 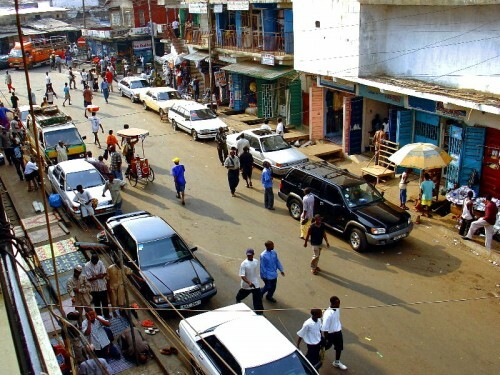 But two months ago, the IMF told the Koroma government to stop its massive tax and duty waivers, which is not only hemorrhaging the economy, but impacting negatively on government receipts and ability to spend on much needed services in the country. In September, the IMF team met with President Koroma, the minister of finance Kaifala Marah; the Governor of Bank of Sierra Leone – Momodu Kargbo; senior government and Banking officials, representatives of the financial sector, private sector, civil society, and development partners. “Sierra Leone continues to battle the adverse impact of two severe exogenous shocks: the Ebola epidemic and the crisis in the mining sector that began with the collapse of iron ore prices and culminated in the cessation of production in April 2015. “Though good progress has been made in containing Ebola, real GDP is expected to decline by 21.5 percent in 2015, following 4.6 percent growth in 2014. Inflation, which moderated in the first quarter of 2015, is now projected to be 9.9 percent in 2015. “Revenue shortfalls, including due to loss of revenue from iron-ore mining, and higher than budgeted spending related to the Ebola epidemic, contributed to deterioration in the fiscal balance, with the deficit projected to be 4.8 percent of GDP in 2015. “Both the current account balance and foreign reserve accumulation benefited from increased inflows related to Ebola transfers, with the current account deficit narrowing to 13.8 percent of GDP, notwithstanding the loss of iron ore export receipts. Sierra Leone faces a challenging near and medium-term outlook, and GDP growth for 2016 is expected to remain relatively unchanged. “Notwithstanding the difficult economic environment, the authorities have forged ahead with their reform program. Following weak performance in 2014, largely due to the challenges caused by Ebola, all program quantitative targets were met as of end-June, despite the shock to revenues. “Implementation of structural reform measures, which were delayed due to the impact of Ebola, have now resumed. Importantly, the Public Finance Management Bill was submitted to Parliament in August. “New timelines have been established for implementation of measures on revenue mobilization, expenditure management, and others. These reforms will require time and persistent efforts before their beneficial impact is felt on the economy. “Looking ahead, strong policy commitment is necessary to maintain macroeconomic stability and achieve long lasting growth. The very difficult fiscal situation calls for enhanced revenue mobilization and expenditure restraint, while safeguarding social programs, especially on post-Ebola recovery. “The mission commends recent attempts to improve revenue collection and administration—it will be particularly important to reconsider the large number and value of waivers and exemptions from the Goods and Services Tax and customs duties, which cost the budget significant revenue. “The implementation of the Government’s post-Ebola Recovery Strategy could boost growth in the non-iron sectors. The strategy could benefit from the support of development partners, whose financial support was crucial in containing the Ebola epidemic. Considering the financing constraints, a commitment to a prudent borrowing policy, with priority being given to grants and concessional borrowing to finance investment projects, will be essential. 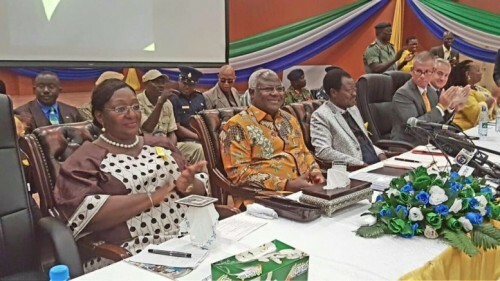 But whilst the IMF is sounding optimistic, the Sierra Leone Telegraph is concerned that the government is continuing to put huge strain on the financial market, which will significantly push interest rates upward, by crowding out the private sector with its increasing sale of treasury bills, new government bonds, and central bank borrowing. This will ultimately impact negatively on the ability of the private sector to invest, create jobs, pay more taxes, and increase the wealth of the nation. The retired Brigadier is holding SLPP to ransom – at what cost? This is the problem when you have a government that removes technocrats from office unconstitutionally because they want to play politics with everything. Dr. James Rogers as governor of the central bank of Sierra Leone had set the stage for the Sierra Leone economy to take off in a globalized marketplace where economies are interconnected, and every time the “big players sneeze, the small players catch cold”. The country was on its way for better participation in the global economy, through privatization of failing governmental organizations or parastatals, and the opening of the Sierra Leone stock market, where funds for private sector economic growth and development would have been raised on favorable terms. All this changed in 2007 when the APC government took power, as they put current leaders in place who either do not understand how economics work, or they are not interested in managing the economy in the interest of the people. For if there was interest in managing the economy well, the government will appoint independent minded technocrats who understand economics and advice them on serious economic matters like debt and how to manage such debt. Take for example, the current budget deficit we are running, and our budget has been in deficit since the war ended in 2002. We need to borrow from international financial markets to finance this debt. To make matters worse, as a small open economy, we are “price takers” we do not have any control over the premium i.e. interest rate we pay on our international debt or bonds we sell to finance our deficits. Such premiums or interest rates are determined by global forces of demand and supply, and thus the need for prudence in managing our finances. Prudence has not been a best friend to the government in Freetown, and so we continue to run these huge deficits, a situation that has created problems for managing our international debts, as well as credibility in borrowing from private international financial markets. Our only recourse now, are IMF concessionary loans or grants, and thus IMF is frowning on the new Airport to be built by the Koroma government – seen as a “political project”. The IMF technically thinks that we will not be able to pay the interest on our current debt, if we were to take on additional loans in the tune of $200 million or more for an Airport. Our country is therefore in deep financial trouble, especially with the slowdown of the Chinese economy and its concomitant impact on the purchase of the minerals our economy depends on. My message to Sierra Leoneans is, wake up from your slumber and start looking at the SLPP as a political party, especially the opportunity the party is offering to bring on board technocrats like Dr. Kandeh Yumkellah, Dr. Paul Tengbeh, Mr. Andrew Keilli, and a host of others who will offer policies to manage the Sierra Leonean economy, as these people have done it in other places, and bring with them “global best practices”. To our aspiring leaders, get your acts together, and start listening to one another so as to be able to build the consensus for a great leadership to emerge and take our country out of this socio-political and economic mess the current APC government has plunged the country into. You know when I started reading your comment, I actually thought you were one honest concerned citizen who is trying to shed light on real issues affecting us sierra leoneans. You made some salient points which I consider to be very pertinent, but I must say your conclusion or should I say your finishing remarks got me highly disappointed. So all this while, you were talking from a political stand point. Why do we always try to politicize everything that is affecting our country today. Don’t we have people who can just point out real issues and not mix them up at the end of the day with politics? Now you made mention of some names who we all know are SLPP party members and you claim these are the ones who can rescue our economy from this stink hole that we find ourselves. Like Seriously? I mean Like Seriously! These very people who you claim can bring us out of this mess, started this mess in the first place. Just take a look at the issues surrounding the party in the first place. Issues that have been lingering for quite some time now and which are still unresolved. Are these the people who are going to get us out of this mess and make us see a brighter day? If one cannot handle issues that surround a handful of people how, then can he handle issues that concern a nation?